manufacturing of lining at tunnel works in mines, etc. feed cutter step Б, mm – 6, 8, 10. * – Theoretical reference value. – along the length – with random lengths from 2 to 3.5 m; with specific cut length within random one. Note: in the delivery set it is allowed to be off-gauge lengths of sheets less than 2 m in an amount of not more than 10% of the batch weight. 2. 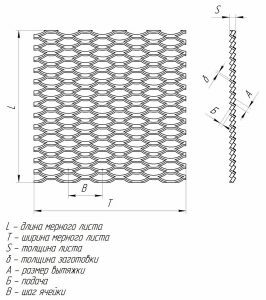 Meshes of expanded metal sheet are arranged along the rolling direction of the sheet (billet). – at one end of the sheet unpunched section may be agreed with the customer (its width is specified in the order). – documents (certificate) for shipped products which should contain a trademark or a short designation of manufacturer, order number, identification mark of the sheet, date when the certificate is issued, confirmation of products compliance to the requirements of technical specifications, stamp of the Quality Control Department. 5. 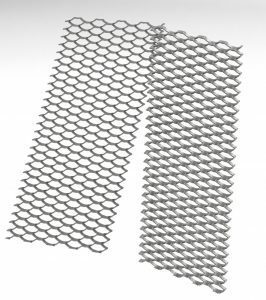 Expanded metal sheets are tied into packs. Pack weight should not exceed 5 tonnes. 7. EMS (ПВЛ) can be transported by all kinds of transport. – packs are laid firmly on block kits with eliminating permanent deformations. – stack is protected from atmospheric precipitation. 9. The manufacturer guarantees EMS (ПВЛ) compliance with the requirements of TU U 271-13625948-002: 2006 following rules of transportation, storage and operation. The warranty period is 12 months from the date of shipment of sheets to the customer. Shipping day is determined by the consignment note or any other accompanying document. Manufacture price and delivery conditions are determined at the time of conclusion of the contract.